Join a talented and diverse group of 42 authors, promoting 44 books, who are touring with Pump Up Your Book! Virtual Book Tours during the month of October 2011. Follow them as they travel the blogosphere from October 3rd through October 28th to discuss their books. There are genres for everyone: from literary fiction to satire, from fantasy to historical fiction, from true crime to memoir, and more! Children’s authors Candace Hall and NeonSeon tour with their books in October. Also on tour are Gregory Earls, Sandi Gelles- Cole, John Langdon, Greg Messel, M.E. Patterson, Mitzi Penzes, Karen Simpson, and Lynn Voedisch. Also on tour are Terrell Dunnum, Emily Sue Harvey, Chen Lizra, Tom McLaughlin, Robert Orfali, and Robyn Wheeler. Visit YouTube at www.youtube.com/watch?v=deidUItSe6s to view a video trailer introducing our authors on tour in October. Pump Up Your Book! 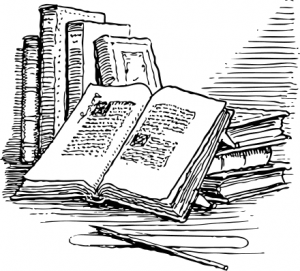 is a virtual book tour agency for authors who want quality service at an affordable price. More information can be found on their website at www.pumpupyourbook.com. Join Garasamo Maccagnone, author of the literary short story collection, Sentiments of Blue (CreateSpace, January 14, 2011), as he virtually tours the blogosphere in June and July on his fourth virtual book tour with Pump Up Your Book. Garasamo Maccagnone is a writer and entrepreneur. The founder of a successful airfreight business, Maccagnone now focuses on his literary career. He is the author of the novel St. John of the Midfield, the novella, For the Love of St. Nick, a collection of short stories entitled, My Dog Tim and Other Stories, and a children’s book titled, The Suburban Dragon. 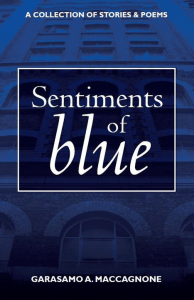 Sentiments of Blue is his latest short story collection. Maccagnone currently lives in Shelby Township where he is working on his second novel, The Sorrows of Pebble Creek. Find the author online at http://garasamomaccagnone.com/. My mother earned her law degree. with every point she made! between the tubes that feed him. Throughout the pages of Sentiments Of Blue, author Garasamo Maccagnone takes the reader deep into the hearts and minds of individuals who find themselves up against some of the greatest challenges of their lives. A creative mix of poetry and short stories, Sentiments Of Blue conveys the raw, unfiltered essence of humanity at its best and worst, painting for the reader a compelling portrait of courage in the face of fear and uncertainty. Maccagnone’s collection leads off with five reflective poetic pieces, culminating with the jarring “My Father’s Foot” – an eye-opening offering sure to catch the reader off guard. Sentiments Of Blue then closes out with five engaging short stories, including the stirring “Perfect Game,” “Holy Thursday,” and the eponymous tale of a conflicted young soul yearning for release from the mundane legacy of his father. All taken together, Maccagnone’s stories and poems comprise a quite moving collection with the potential to resonate within readers for a long time to come. An impressive, thought-provoking read. Book spotlighted at Books, Products and More! Wendy Wax, author of the women’s fiction novel, The Accidental Bestseller (Berkley Trade), will be stopping off at As The Pages Turn and Single Titles today! Who knew the truth would make such great fiction? Once upon a time four aspiring authors met at a writers’ conference. Ten years later they’re still friends, veterans of the dog-eat-dog New York publishing world. Mallory St. James is a workaholic whose novels support her and her husband’s lavish lifestyle. Tanya Mason juggles two jobs, two kids, and a difficult mother. Faye Truett is the wife of a famous televangelist and the author of bestselling inspirational romances; no one would ever guess her explosive secret. Kendall Aims’s once-promising career is on the skids—as is her marriage. Her sales have fallen, her new editor can barely feign interest in her work—and her husband is cheating. Under pressure to meet her next deadline, Kendall holes up in a mountain cabin to confront a blank page and a blanker future. But her friends won’t let her face this struggle alone. They collaborate on a novel none of them could write by herself, using their own lives as fodder, assuming no one will discover the truth behind their words. No one is more surprised than they are when the book becomes a runaway bestseller. But with success comes scrutiny and scandal. Now all bets are off….as these four best friends suddenly realize how little they’ve truly known each other. You can visit Wendy’s website at www.authorwendywax.com. Alan Kennedy-Shaffer, author of the nonfiction political book, THE OBAMA REVOLUTION, will be stopping off at Between the Covers on Day One of his virtual book tour with Pump Up Your Book Promotion! The first book to be written by a campaign staffer and offering rare insider glimpses, The Obama Revolution explores how a generation of believers and the politics of hope won the presidency for Barack Obama and changed the world. 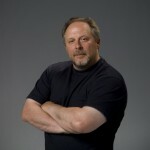 You can visit Alan online at www.alankennedy-shaffer.com. THE OBAMA REVOLUTION VIRTUAL BOOK TOUR ‘09 will officially begin on April 1, ‘09 and end on April 30. You can visit Alan’s tour stops at www.virtualbooktours.wordpress.com in April to find out more about him and his new book! Leave a comment on his blog stops throughout the month of April and you can become eligible to win a FREE virtual book tour or an Amazon $50 gift certificate from Pump Up Your Book Promotion! J.W. Nicklaus, author of the short story collection, THE LIGHT, THE DARK & EMBER BETWEEN, will be stopping off at Blogcritics on Day One of his virtual book tour with Pump Up Your Book Promotion! Fifteen stories: From the wispy fog of a love lost at sea, to an orphaned child who delivers a present of her own during a war-torn Christmas. These stories are gentle reminders to each of us of what it is to be human, and certainly of our affinity for the slightest glint of Hope. You can visit J.W. online at www.avomnia.com. THE LIGHT THE DARK & EMBER BETWEEN VIRTUAL BOOK TOUR ‘09 will officially begin on April 1, ‘09 and end on April 30. You can visit J.W.’s tour stops at www.virtualbooktours.wordpress.com in April to find out more about him and his new book! Leave a comment on his blog stops throughout the month of April and you can become eligible to win a FREE virtual book tour or an Amazon $50 gift certificate from Pump Up Your Book Promotion! Karen White, author of the contemporary fiction novel, THE LOST HOURS, will be stopping off at S. Krishna’s Books on Day One of her virtual book tour with Pump Up Your Book Promotion! Now a near fatal riding accident has shattered Piper’s dreams of Olympic glory. After her grandfather’s death, she inherits the house and all its secrets, including a key to a room that doesn’t exist—or does it? And after her grandmother is sent away to a nursing home, she remembers the box buried in the backyard. In it are torn pages from a scrapbook, a charm necklace—and a newspaper article from 1929 about the body of an infant found floating in the Savannah River. The necklace’s charms tell the story of three friends during the 1920s— each charm added during the three months each friend had the necklace and recorded her life in the scrapbook. Piper always dismissed her grandmother as not having had a story to tell. And now, too late, Piper finds she might have been wrong. You can visit Karen online at www.karen-white.com. THE LOST HOURS VIRTUAL BOOK TOUR ‘09 will officially begin on April 1, ‘09 and end on April 30. You can visit Sheri’s tour stops at www.virtualbooktours.wordpress.com in March and April to find out more about her and her new book! Leave a comment on her blog stops throughout the month of April and you can become eligible to win a FREE virtual book tour or an Amazon $50 gift certificate from Pump Up Your Book Promotion! Congratulations is in store for one of our blog hosts, April Pohren, of Cafe of Dreams! April hosts our authors on virtual book tours throughout the months and special recognition goes to her for all the good work she has done for us in our behalf. If you would like to find out more about April and her wonderful book blog, visit www.cafeofdreams.blogspot.com.